The Ancestry databases U.S., Consular Registration Certificates, 1907 - 1918 and U.S., Consular Registration Applications, 1916-1925 contain records pertaining to "naturalized or native born American citizens who intended to stay in a foreign country for a protracted length of time." Records from these databases have a lot of information about the individual who was requesting to stay outside the United States. There are almost 800 entries across the two databases for people who were born in Ireland, became a citizen of the United States when they moved there, and then were required to file registration with a U.S. consulate when they resided outside the United States. In almost all examples for Irish born people, their county or area of birth was recorded. The majority of these people moved back to Ireland for various lengths of time but some also moved to Great Britain. Denis Barry was born in Sunday's Well, County Cork on 15 May 1860. At some point in his life he moved to the U.S., naturalized, and lived in Washington D.C. He arrived back in Ireland in 1900 to reside at 17 Friars Avenue, Cork City. His reason for returning to Ireland was 'health failing and it is my intentions [sic] to return to the United States, if health improves." His Certificate of Registration of an American Citizen is dated 18 September 1907. A search of the 1901 Census of Ireland shows Denis Barry residing with his two unmarried sisters at the address he provided. If you find a person of interest in these databases, be sure to look at the pages either side of the relevant image as there will usually be more than one page in a person's application. Typically, a witness who believed the applicant's statements to be correct is also listed on the document. In the case of Denis Barry, William Ellis of 11 Douglas St, Cork, verified the information provided by Barry. Other records from applicants provide the name of a spouse, any children and all their birth places, if the applicant was married and had children. Ancestry.com, U.S., Consular Registration Certificates, 1907 - 1918. 2013. http://search.ancestry.com/search/db.aspx?dbid=2995: accessed 7 February 2016. 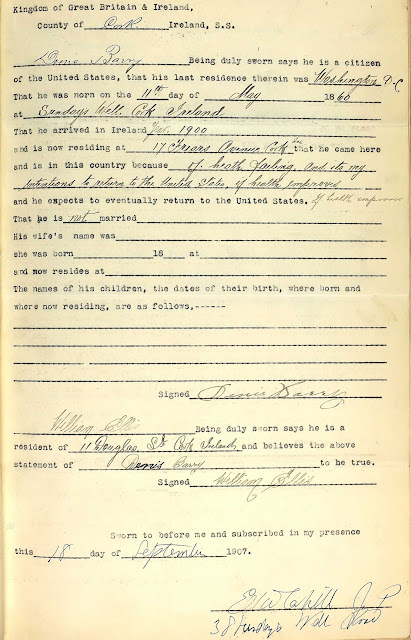 United States, Department of State, Bureau of Citizenship, Certificate of Registration of an American Citizen, Number 48774, Denis Barry, dated 1 September 1907; digital image, U.S., Consular Registration Certificates, 1907 - 1918, Ancestry (http://www.ancestry.com), accessed 6 February 2016. The National Archives of Ireland, 1901 Census of Ireland, County Cork, DED Cork Urban No. 4, Townland/Street Friars Avenue or Granbraker Road, house 4, Form A , Denis Barry; digital image, The National Archives of Ireland, http://www.census.nationalarchives.ie/reels/nai000518111: accessed 7 February 2016. Labels: 1900s, 1910s, 1920s, Emigration, Immigration, Place of Origin, U.S.A. The Act of Union came into effect on 1 January 1801 and created the United Kingdom of Great Britain and Ireland. Various efforts at repealing the act occurred both within and outside Ireland. Those who were of this mindset became known as repealers and many Repeal Associations were established in the United States and Canada. One such example was in Prince Edward Island (PEI), Canada in the 1840s. In the 1980s, Terrence M. Punch (more about him in a recent blog post) wrote in The Island Magazine about finding newspaper articles from 1843 that listed the names of Irish repelaers in PEI. Importantly, an Irish place of birth was also provided for many of the men. The newspaper in questions was the Halifax-based Register and the lists of names were published in various editions from October and November of that year. Punch's first publication provides the names of 149 men and over 100 Irish places of birth. His second lists 253 men with the majority of names also having an Irish birthplace provided. You can access both publications on the website of the University of Prince Edward Island, as they have digitized old editions of The Island Magazine, or click the links below. Punch, Terrence M. A Prince Edward Island Repeal List for 1843. The Island Magazine. 1986, no. 20 Fall Winter. pp. 29-31. Available online at http://vre2.upei.ca/islandmagazine/fedora/repository/vre%3Aislemag-batch2-266: accessed 31 January 2016. Punch, Terrence M. A Prince Edward Island Repeal List for 1843. The Island Magazine. 1987, no. 21 Spring Summer. pp. 33-36. Available online at http://vre2.upei.ca/islandmagazine/fedora/repository/vre%3Aislemag-batch2-281: accessed 31 January 2016. History of the Fire and Police Departments of Minneapolis was published by The Relief Association Publishing in 1890. It provides an historical overview of the city's fire department from about 1850 and the police department from 1855. Traditionally, many Irish immigrants and their descendants joined both departments throughout the United States, making this publication very useful if you had such as ancestor in Minneapolis, Minnesota. The detailed history of both departments provides a vivid idea of what it was like to work as a fireman or policeman in the city. The majority of the publication is given over to the fire department and there are many illustrations of the tools they used, as well pictures of those who occupied the higher ranks of both institutions. Of particular interest to genealogists will be chapter 16, Date of Organization of Companies (p. 163), and chapter 17, Company Quarters and Fire Apparatus (p. 172). Both chapters list the members of each engine company in the city as they existed at the time of publication. Name, rank, age, country of birth, and previous occupation are provided. The example, below, shows the strong Irish influence in Engine Company no.1, with nearly all members born in Ireland, or U.S./Canadian born with traditionally Irish surnames. 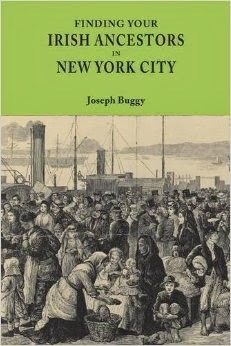 The publication of this book was timely as it can serve as a census substitute for the destroyed 1890 U.S. Federal Census. It is a niche resource, but incredibly useful for those with ancestors in that niche. Access the book on Internet Archive. History of the Fire and Police Departments of Minneapolis. Minneapolis, MN: The Relief Association Publishing. 1890. Available online at https://archive.org/stream/historyfireandp00costgoog#page/n168/mode/2up: accessed 16 January 2016.